The goat is the most common farm animal found around the world, and has been providing man with its products — milk, meat, fiber, leather, pack animals and companions — for over 5000 years. More goats milk products are consumed worldwide than cows milk products, resulting in a vast array of distinctive cheese styles from many different cultures and countries. The goat is a highly intelligent, clean, affectionate, and independent animal capable of surviving in areas not suitable for larger livestock. We raise Alpines, a breed that originated in the French and Swiss alps. The Alpine dairy goat is a medium to large size animal, alertly graceful, and the only breed with upright ears that offers all colors and combinations of colors, giving them distinction and individuality. They are hardy, adaptable animals that thrive in any climate while maintaining good health and excellent production, noted for their strong individual personalities and milk that is excellent for cheesemaking. The hair is medium to short. The face is straight. A Roman nose, Toggenburg color and markings, or all-white is discriminated against. This breed is composed of several varieties, including the British, Rock, and Swiss Alpine, but the French Alpine is by far the most numerous. Painting and breed information from the American Dairy Goat Association. The goats are milked twice a day, every day, at about 5:00 a.m. and 5 p.m. We use a milking machine that milks two goats at a time. First, the goat’s udder is washed to remove any dirt. Then the inflations are attached, which use vaccuum pressure to gently remove the milk. When the milk flow slows, the inflations are removed, and any milk remaining in the udder is stripped by hand. After milking, the teats are treated with a product to disinfect the teat and speed the closing of the milk orifice, thus lessening the risk of mastitis, an infection of the udder. All milking equipment and containers are thoroughly cleaned and sanitized with commercial products between milkings. Directly after milking is finished, the milk is filtered into sanitized jars, and placed immediately into an ice-water bath. State regulations require that the milk be chilled to 45 degrees within one hour of milking. The goats receive a commercial dairy grain ration twice daily, fed on the milking stand, and free-choice local grass hay. 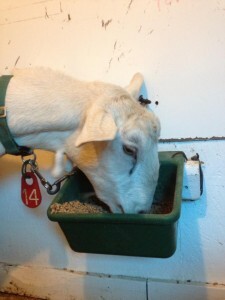 Our 40 milking goats eat several tons of grain a year. We purchase about 1200 bales of hay a year, depending on size and quality of hay. The goats also have access to water at all times from a large barrel with a constant-level float valve. For supplements, the goats have free access to sodium bicarbonate (a rumen buffer), mineralized salt, and kelp meal. They also receive a high protein feed supplement containing yeast cultures, and sunflower seeds, both of which contribute to a glossy coat. Each year, we open up more of our woods so the goats can browse on saplings and brush, helping us to clear our land! 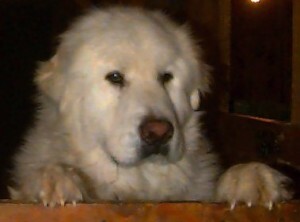 Sadly, we lost Claymore in 2002, and we haven’t had the heart to replace him. 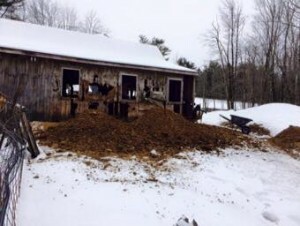 During the spring, summer, and fall, we rake out manure and waste hay from the barn on a weekly basis. All barn waste is composted in next year’s garden or used as mulch. In the winter, we let the bedding build up to a “deep pack,” which serves to insulate the goats from the cold ground, and provides some warmth from the composting action. Regular cleaning also helps control flies and rodent activity. We spread a layer of locally obtained limesand inside the barn, which helps to deodorize the barn floor and control foot problems, as well as outside the barn, which helps to manage mud build-up. Free-ranging chickens also help with fly control. The normal gestation period for a goat is about 150 days. 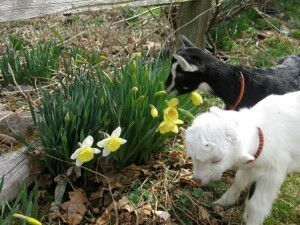 Goats usually have twins, although triplets, quadruplets and even quintuplets do occur. In 1994 we averaged a 300% kid crop, with our first set of quadruplets! In 1995 we had a total of 21 kids from 10 does, with another set of quadruplets; in 1996 we had 19 kids from 12 does freshening. By 1999, it’s all a blur–I think we’re up over 50 kids now! Kids are disbudded — or dehorned –at two to five days of age. They are bottle-fed milk until they are about three months of age. Hand-raising the kids encourages people-friendly goats, as well as assuring that each kid receives its fair share of milk. Coming up with names for all these kids presents a yearly challenge. Our daughter Fiona has definite ideas about their names, and she usually ends up in charge. We try to keep a Scottish theme going, consequently, they have names such as Bonnie, Heather, Islay, Skye, Brigadoon, and Dundee. Fiona favors such names as Tulip, Belle, and Dandelion. We are always open to suggestions! Goats are not susceptible to tuberculosis, but are required to be tested for it for our licensing. Our goats also receive rabies and tetanus shots annually. Their hooves are trimmed every couple of months. 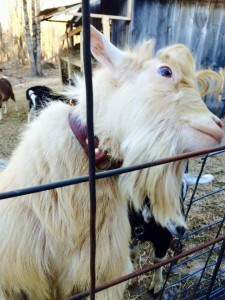 As goats age, their teeth may need attention. Goats need to be wormed on a regular basis to combat intestinal parasites. The three bucks live in a separate barn to control unplanned breedings. Bucks have a scent gland in the top of their heads, which gives off a musky odor that lady goats love, but can be a little strong for humans. Isolating the boys helps manage the goaty smell. They smell much worse in the fall during breeding season. We do not offer buck service. We have been actively culling down our herd to a more manageable size. We no longer offer breeding stock or pet stock for sale, although we occasionally have meat kids in the spring.